30 MMS September 2017 mmsonline.com RAPID TRAVERSE Machining Technology in Brief software functions provide more accurate and r e l i a b l e r e s u l t s w h e n b a s e d o n a c c u r a t e and complete models of cutting tools and com- plete assemblies. Obtaining these 3D models from vendors or constructing them in house can other wise cause delays and inaccuracies t h a t m i g h t d i m i n i s h t h e v a l u e o f u s i n g t h e simulation or verification capabilities of CNC programming systems. Perhaps the most notable takeaway from this look at MachiningCloud as an example of Indus- try 4.0 and equivalent concepts is that the net- worked flow of coherent, pertinent data leads to better decisions about machining processes. 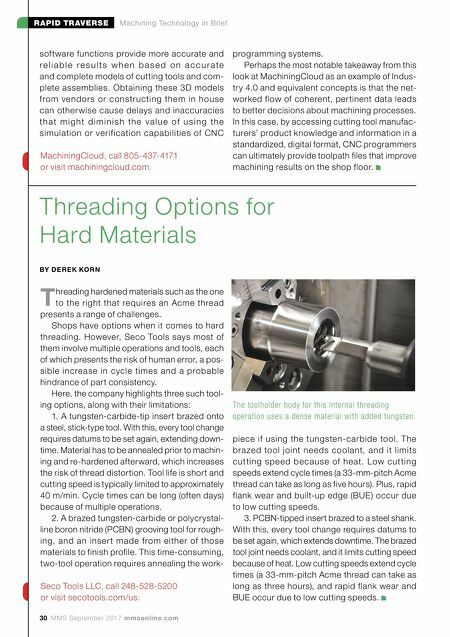 In this case, by accessing cutting tool manufac- turers' product knowledge and information in a standardized, digital format, CNC programmers can ultimately provide toolpath files that improve machining results on the shop floor. 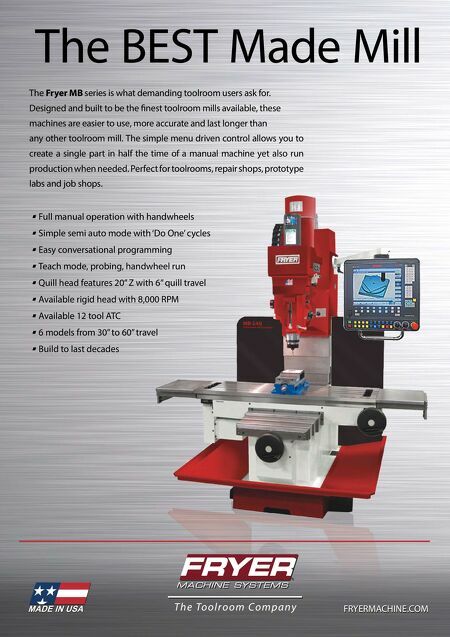 MachiningCloud, call 805-437-4171 or visit machiningcloud.com. Threading Options for Hard Materials BY D E R E K KO R N T hreading hardened materials such as the one to the right that requires an Acme thread presents a range of challenges. Shops have options when it comes to hard threading. However, Seco Tools says most of them involve multiple operations and tools, each of which presents the risk of human error, a pos- sible increase in cycle times and a probable hindrance of part consistency. Here, the company highlights three such tool- ing options, along with their limitations: 1. A tungsten-carbide-tip insert brazed onto a steel, stick-type tool. With this, every tool change requires datums to be set again, extending down- time. Material has to be annealed prior to machin- ing and re-hardened afterward, which increases the risk of thread distortion. Tool life is short and cutting speed is typically limited to approximately 40 m/min. Cycle times can be long (often days) because of multiple operations. 2. A brazed tungsten-carbide or polycrystal- line boron nitride (PCBN) grooving tool for rough- ing, and an inser t made from either of those materials to finish profile. This time-consuming, two-tool operation requires annealing the work- piece if using the tungsten-carbide tool. The bra zed tool joint needs coolant, and it limits cut ting speed because of heat. Low cut ting speeds extend cycle times (a 33-mm-pitch Acme thread can take as long as five hours). Plus, rapid flank wear and built-up edge (BUE) occur due to low cutting speeds. 3. PCBN-tipped insert brazed to a steel shank. With this, every tool change requires datums to be set again, which extends downtime. The brazed tool joint needs coolant, and it limits cutting speed because of heat. Low cutting speeds extend cycle times (a 33-mm-pitch Acme thread can take as long as three hours), and rapid flank wear and BUE occur due to low cutting speeds. Seco Tools LLC, call 248-528-5200 or visit secotools.com/us. The toolholder body for this internal threading operation uses a dense material with added tungsten.